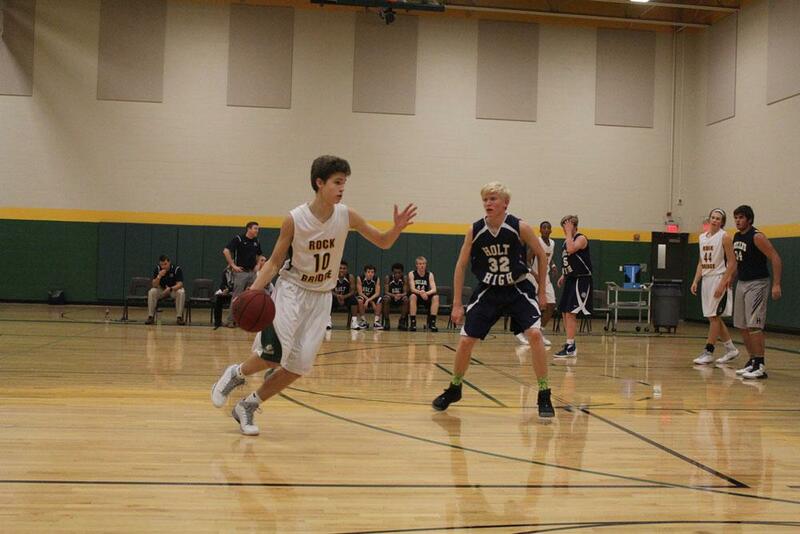 Following a block, junior Eric Hoagenson, 10, finds freshman teammate Ben Cooper. Cooper laid in the assist, extending the lead to 16-1. Since their opening tip Dec. 4 against Southwest, the varsity boys’ basketball team has been executing perfectly against their opposition, maintaining an undefeated 3-0 record. However, the Bruins’ tally fell to 3-1 yesterday when DeSmet overpowered Rock Bridge 47-31 at Duchesne High School in St. Charles. Wiley was arguably the team’s top performer in the showcase. He provided RBHS with not only superb rebounding, but also fantastic scoring, putting up 10 of the Bruins’ 31 points. Despite Wiley’s brilliant contribution, DeSmet left St. Charles the victors. RBHS started out hot by leaping out to a 12-9 lead by the end of the first quarter, edging the Spartans early on. Thus, it would seem as if the Bruins were in for another win to add in the books. Unfortunately, the beginning of the second quarter was when the tables began to turn for RBHS. It became apparent late in the second quarter that DeSmet had figured out how to deal with the Bruins. While RBHS came into the second quarter confident with the lead, DeSmet had used the break to figure out a successful plan to turn the tables. That exact plan resulted in their gaining an advantage the Bruins couldn’t overcome for the entirety of the game. Like Wiley, Widhalm believes DeSmet’s zone defense wasn’t the only factor in the loss, stating that the combination of the Spartan’s excellent defense and slight offensive troubles in the Bruins’ offense resulted in the unfortunate loss. However, it is only the first loss of the season for RBHS. On Tuesday next week, the varsity and junior varsity teams will be hosting East at home. The match-up will mark the first home game for the Bruins this season and will be the varsity team’s only game with home court advantage until January 5, 2016, when RBHS will host the Lee’s Summit West Titans. Will you be attending RBHS’s first home game? Leave a comment below and let us know.